After a surprisingly dry and hot summer here in Northwest Washington, today the skies opened up and we had a downpour that was insane. The kids stripped down and ran out in the backyard and I could see the plants stretching up toward the moisture. Our driveway turned into a lake. For about thirty minutes it went on like this and then…gone. Don’t worry. We won’t be missing our old friend rain around here for too long. It’ll be back to stay in a month or so and will completely outstay its welcome. But tonight, I have the window open and I can smell the freshness. 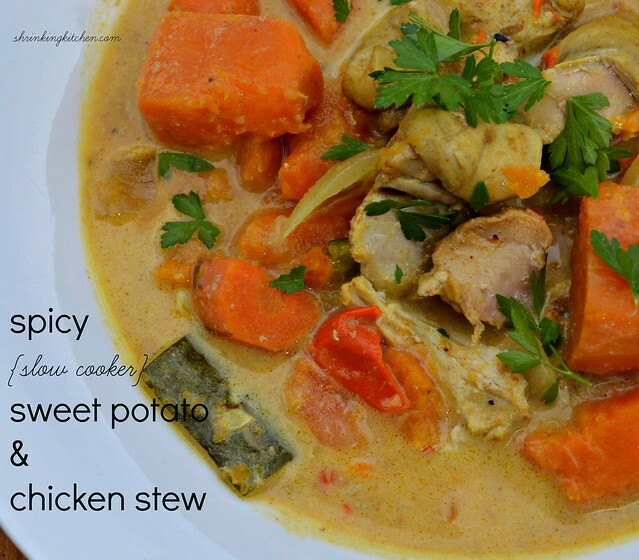 And I have a cool breeze – it’s the perfect night for this warming and comforting sweet potato and chicken stew. I actually made this yesterday, when it was relatively hot outside – but no worries. It’s a slow cooker meal. No hot kitchen for me! I’ve eaten it two nights in succession, and it was even better tonight. Don’t you love food that is EVEN BETTER as leftovers? Throw this easy meal into the slow cooker in the morning and turn it to low (or if you forgot, at noon, then just set it to high!). By the time you’re ready for dinner, all you’ll need to do is thicken it up a bit and throw in some fat free half and half OR light coconut milk – the kind in the can, not in the carton. And a note on the chicken – the thighs will stand up to the long cooking time and stay moist. If you’re subbing chicken breast, you might want to cut your cooking time. Top it with some fresh parsley or cilantro, curl up in a cozy chair and enjoy the warmth. Pull out the slow cooker (duh). Throw all the vegetables (including garlic) and the chicken into the slow cooker. Sprinkle the spices over everything and toss with a wooden spoon to mix. Pour the chicken broth over everything. Set your slow cooker to high heat (for 4 hours) or low (8 hours). In the last half hour of cooking, mix the cornstarch with a few tablespoons of the broth from the crockpot in a small bowl and pour the mixture back into the stew. Let cook for another 20 minutes to half hour to thicken, on low heat. Right before serving, stir in the half and half or coconut milk. This will give the broth a velvety texture! Season with salt to taste and serve with a sprinkling of flat leaf parsley or cilantro. I made this tonight. It is very tasty with just a hint of sweetness. I’m guessing that comes from the potatoes? I like it. I just hope the husb likes it too. Looks yummy! Trying tomorrow. Why the milk in the can, not the carton? Just curious. The coconut milk in the can is creamy – heavier. The kind in the carton is more for drinking and you don’t really get the coconut flavor. I’m not a fan of curry. Any ideas for a substitute, or just omit? This looks so wonderful otherwise! Hmmm. Maybe you could just go with a little more cumin? The curry is definitely not necessary for this to be good! Let us know what you end up doing and how it turns out!